Team leaders in Baraka, Zambia, receiving new bicylces Late last year, the volunteer care workers in Baraka, Zambia, identified a need within their community: Being in a rural location often means care workers must walk long distances to visit orphans and families in need of home-based care. Homes that are far away are not visited very often because the distance is difficult to cover on foot. Not only is home visitation sometimes difficult, there is also the problem of transporting sick children to the clinic or the hospital - both are far from most homes. In addition, the task of gathering supplies for the local care centre means that volunteers often must walk 5km to the road, hitch a ride 20km to town, buy supplies and do the trip in reverse with supplies in tow! The volunteers were in need of a way to make their work more efficient. The solution? Bicycles! 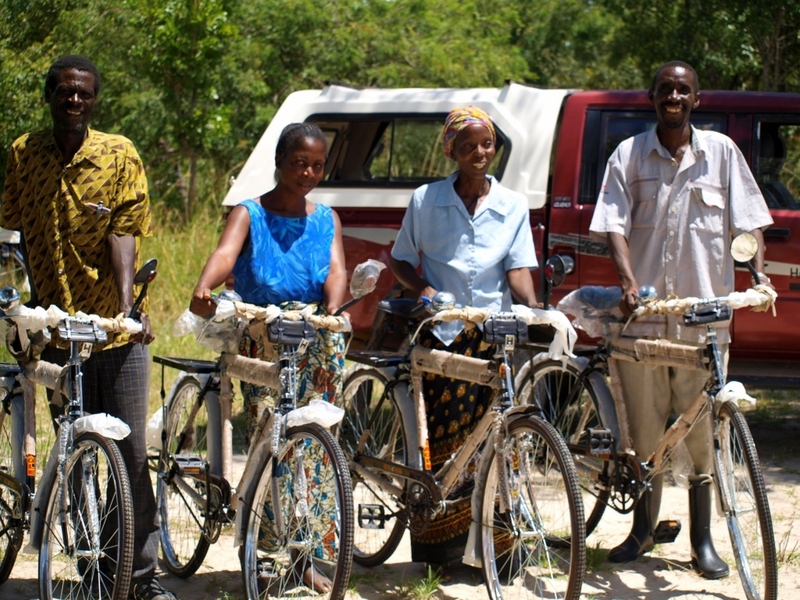 A proposal was submitted to purchase four brand-new bicycles for Baraka care workers to share. With the assistance of Hands at Work USA and a generous family from Wisconsin, money was allocated and by March 2011 the bikes had been purchased. There was even some spare change to be used to buy spare parts as needed! Now the distance to visit a home can be covered in less than half the amount of time it takes to walk, remote homes can be visited more often, supplies can be easily carried and sick children can be transported for medical care. Enjoy your bikes!